If you make sure nothing distracts you and even eliminate the possibility of distraction you are at the right place. But this is only the first step. Even if nothing distracts you there you can still distract yourself. Some people call that to „entertain oneself“. All of a sudden you want to clean dishes, wash clothes or wipe the dust. Say what? Procrastination is your ally in this kind of mindset and the enemy of focus. That is why you need to take the second step. Go to where you think it is boring and there is nothing to see. It can be a dark place, gray place, somewhere triste with no windows, somewhere isolated, a location where the only thing that excites you is in front of you — oftentimes a screen (big, small, whatever size and format). Distraction is easy entertainment. It is the easy way to find meaning in life. That is why so many people are attracted to it. But it is also superficial. Connections you make in your distraction time are important, no question. How important do you think are the connections you make when you are just on your own? What meaning can you get out of them? How much progress can you make for a project and how much growth for yourself can you make when the only attraction is what comes out of the movement from your fingers and the sensation your eyes observe from this artifical light source? When the environment you are in does not matter anymore, when your lonesomeness is no longer important and your actions simply happen because of the connection you built up feeling the being of here and now in the place you sit with the machine in front of you, you are in focus. Focus is hard enterainment. It is hard to get into it. That is why not so many people are attracted to it (but want it). Focus is a rare friend. You do not find him/her on any corner — and never during distraction. Focus is the prerequisite for flow. Flow is even harder to get into. That is why only a few people on the entire planet have flow moments. Flow is not exclusive but so uncommon that you can consider it to be extinct for most people and endangered (like a rare animal) for the practictioners of flow. But flow is another topic. Flow is a total different beast. Right now you are only longing for focus. Focus on focus. Be a good friend to him/her, nourish the friendship. Focus does not reward distraction. Focus penalizes you for 23 minutes when you decided to hang out with the (I ungrudgingly admit) attractive distraction muse. Distraction through entertainment is a business model. People have an interest that you are distracted because they know today’s real market value is attention. There are reasons why the fear of missing out (fomo) exists, why it is being instrumentalized to create social pressure to also come and join the gathering, event, sit-in, whatever. You will not be able to turn off your longing to also be part of the group. Fomo is an always-working business model. There is this guy you like also coming to the party. There is the girl from your neighboring city you’ve been secretly in love with — and she will join Chris’ birthday party. Do you come? How hard is it for you to say „No“ now and how harsh would your friends consider your „No“? Social decision dilemma (short SDD; a term I coined just now) is a big force. If you let yourself drag into it and do not make an effort to resist to say „Yes“, you will end up going. It will be great. You will enjoy it. Distraction muse will give you a high-five and you will have a dirty-dancing time of your life — a high life. Focus is always an active effort. A wise man, I do not remember who his but where I heard about it, said: Focus is the acronym for „follow one course until successful“. Hence, if you want success — whatever success means for you — you need to focus. Focus. Focus. Focus. Focus. Focus. Focus. You are already getting distracted by reading all that. So stop reading because this is the end. Everything I am saying now is driven by my distraction muse wanting to give you a hard time getting back into your deep focus work. In fact, your distraction muse is giving my distraction muse a thumps-up while they are laughing up their sleeves. Both of them are now allies — two muses sticking together. Time for you to stop the distraction affiliation. But how can you possibly stop reading when you want to know how this will end? I will help you because this is it. No more. I am stopping because you were not able to. 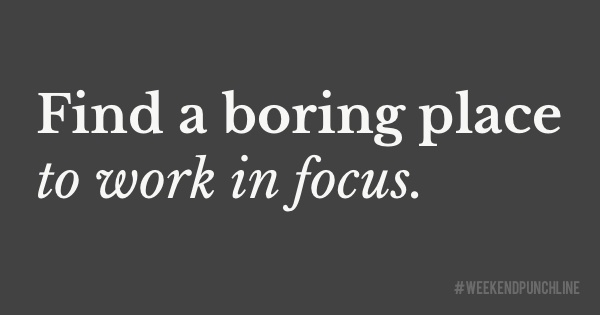 That is how you also get back into focus, by a friendly way of forcing you to STOP DISTRACTION! This was episode 22 of the #weekendpunchline . Every Saturday and Sunday.